1961 – First NASA astronaut Alan Shepard piloted the Freedom 7 Mercury capsule on its 15-minute 28-second suborbital flight. 1992 – Id Software released Wolfenstein 3-D. It wasn’t the original first person shooter, but it launched the form into widespread popularity. 1999 – Microsoft shipped Windows 98 SE to manufacturers. The new version included Internet Connection Sharing, Internet Explorer 5, Windows NetMeeting 3. Like Tech History? 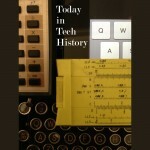 Get the illustrated Year in Tech History at Merritt’s Books site. 1925 – The first commercial radio facsimile transmission was sent from San Francisco, California to New York City. It was a photograph showing Louis B. Mayer presenting Marion Davies with a gift. 1930 – BBC Radio made the startling announcement that nothing terribly important had happened. Listeners who tuned in to hear the news bulletin were told, “There is no news,” followed by piano music. 1986 – Newspapers reported that IBM had become the first to use a megabit chip, a memory chip capable of storing one million bits of information, in its Model 3090. In 1926 – Robert Goddard conducted his first successful launch of a liquid-fueled rocket in Auburn, Massachusetts. In 1999 – Sony released Everquest the Massively multiplayer 3D world where you could play as a wizard, rogue or knight. It followed two years after Ultima Online and would be followed several years later by World of Warcraft. In 1999 – Mac OS X Server 1.0, the highly-anticipated precursor of OS X desktop version (code name Hera) was released. Last week I sat down to line out everything I knew about the services and equipment you need to watch TV (legally) using the Internet. I ended up with a brief guide that lines out everything a beginner needs to know to get started in the US. Depending on your situation it may save you money and it certainly gives you more control. Assuming you have the Internet and can watch videos already this guide gives you the information you need to get started with the right services and equipment to watch the programs you want, when you want and where you want. In 1860 – Herman Hollerith was born. He would grow up to build the first punched-card tabulating machines as well as found the company that was to become IBM. In 1940 – Ernest O. Lawrence delivered his 1939 Nobel Prize in Physics banquet speech in Berkeley, California, instead of the usual Sweden, so he could keep raising funds for his cyclotron research which got him the prize in the first place. In 1996 – Microprose released Civilization II, a sequel to Sid Meier’s Civilization, and the version that would launch the franchise to widespread popularity. In 2012 – Orders began for the small and inexpensive Raspberry Pi computer. In 1947 – The first closed-circuit broadcast of a surgical operation showed procedures to observers in classrooms at Johns Hopkins University. In 1954 – The Westinghouse H840CK15 went on sale in the New York area. It is generally agreed to be the first production television receiver using NTSC color offered to the public. Only 30 sets were sold at $1,295 a pop. In 1959 – Discoverer 1 was launched on a Thor-Agena A rocket and became the first man-made object ever put into a polar orbit. In 1877 – Alexander Graham Bell demonstrated the telephone for the first time in public at the Salem Lyceum Hall. The demonstration ended with the sending of the first telephone news dispatch which was received by the Boston Globe. In 1973 – Along Interstate 71 in Ohio, the first metric distance road signs to be erected in the US were put in place. They informed of the distance between Columbus and Cleveland and Columbus and Cincinnati. In 2001 – The NEAR Shoemaker spacecraft touched down on 433 Eros after transmitting 69 close up pictures. It became the first spacecraft to land on an asteroid. In 1951 -TV viewers witnessed the live detonation of an atomic bomb blast, as KTLA in Los Angeles broadcast the explosion of a nuclear device dropped on Frenchman Flats, Nevada. In 1972 – Hewlett-Packard introduced the first scientific handheld calculator, the famous HP-35 for $395. It was the first handheld calculator to perform logarithmic and trigonometric functions with one keystroke. In 1985 – Shortly after its founding the November before, the Search for Extraterrestrial Intelligence Institute kicked off operations. In 1997 – Dave Winer changed how he displayed ‘Scripting News’ so that it always showed the last ten days of posts. In other words, the way every blog does it now. Whether this makes it the ‘first blog’ or not, it was extremely influential and is definitely one of the oldest blogs out there, predating the term blog, of course. In 1872 – E.D. Barbour of Boston, Mass. received the first US patent for an adding machine capable of printing totals and subtotals. The so-called “calculating machine,” proved impractical. In 1967 – Hong Kong TV, the first free over the air commercial television station in Hong Kong was established. Today it is known as TVB. 2006 – The Nintendo Wii launched in North America. In 1856 – Nikola Tesla was born in Smiljan, Lika, Croatia, which was then part of the Austro-Hungarian Empire. His father was a Serbian Orthodox Priest and his mother an inventor of household appliances. In 1962 – The world’s first communication satellite, Telstar, was launched into orbit from Cape Canaveral on a Delta rocket. In 1990 – The Electronic Frontier Foundation was formally founded, immediately coming to the aid of Steve Jackson Games, who’s BBS had been seized by the Secret Service.